Chicken coop enclosed in an exercise run to give better protection to chickens. Ramp leading from sleeping area into the run. Large door on front of run for easy acces. 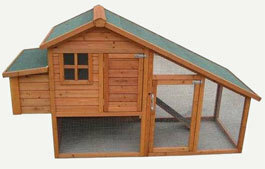 Removable nesting box which can be used for a variety of animals rather than just chickens.